Why do two year olds say “no”? Why do grandparents tell the same story over and over? Why do teens think about themselves so much? These are Human Development questions answered in this downloadable etext. and why should your homeschooling high schooler have this on his/her transcript? -Human Development is the study of God’s wonderful design for people as they grow from conception through old age. It explains how people change physically, cognitively, socially and emotionally throughout each stage of life. -Human Development is a 1 credit high school health credit. -Human Development is the perfect course for any teen that has to interact with others and/or plans to grow up, get married, have a family, (and maybe take care of his aging parents someday). Our Human Development curriculum for high school from a Christian Worldview helps students understand how God designed people to grow, from conception through old age. This is a one credit health/social sciences curriculum. This lively 106-page text written by Vicki Tillman MA (a homeschooling mom and practicing licensed professional counselor) is updated in its 2nd edition to download to your device in editable .pdf format — you type the answers right in! It is easy to use, fun, and is presented at an average high school level. Instructions are included for activities and readings to increase the credit to college prep, advanced, or honors. Human Development from a Christian Worldview is designed for self-instruction but also includes group discussion questions making it perfect for use in homeschool co-ops or group classes. Help your homeschooler understand the people in his/her world with our Human Development curriculum! 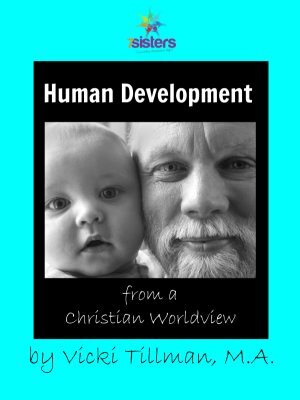 Click here to view an excerpt from Human Development. What are homeschool parents saying about Human Development from a Christian Worldview? “7sisters curriculum has been exactly what we needed for our high school students. We have a freshman, sophomore & a junior in our homeschool high school. We used the human development course as part of our health curriculum. All three of our students took it together. Two of them pursued the honors level and our oldest chose to follow the basic level. It held all of their attention and they all learned so much from it. It allowed for honest discussions and left room for exploration. They were all able to choose activities that fit their own personal learning styles.” – A.C.
“Wonderful book! My daughter has very much enjoyed learning from it for her health credit in high school. She has enjoyed many of the enrichment activities.” – Brenda E.